Engineers’ Day was celebration in GNA University with an euphoric involvent of budding engineers at the GNA University Phagwara, on dated 15th sept ,2016. Spearheaded by the Faculty of Engineering and Technology (FET) ,GNA University the Chief Guest Dr Rupinder Pal Singh Suker-Chakia, Chairman, the Institute of Engineers Ludhiana Local State centre garlanded the photograph of Sir Mojkshagundam Visveshvarya, and in his address of the chief guest called upon the engineers to open up minds and inculcate engineering spirits rather than only the former. Prof Prem Kumar, the vice Chancellor of GNA University exhorted the students to take on the developmental responsibilities for which the University strives to prepare them. The vice-chancellor GNA University,adviced the student to produce Innovation in engineering Earlier introducing the need, spirit and religion of this Engineer Day, Prof Prof P.Thareja Dean, Faculty recalled the importance of the engineer’s daycelebration which reminded Responsiveness- to esucationa, National and Societal development and even the conduct and bearing. Responsiveness was always at the root of engineering developments be it information technology- that promises a fast response now called SMART. FET organized a seminar on SMART cities on this day, of which the proceedings & CD were released.. 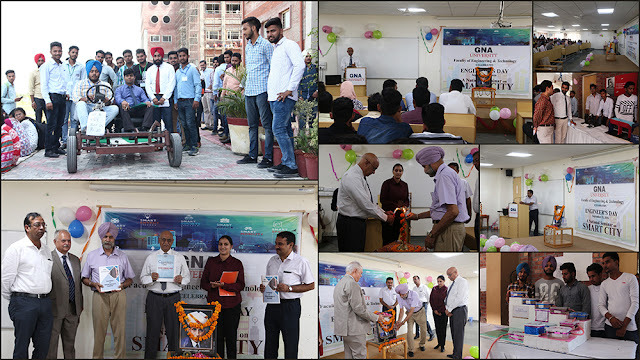 Speaking about the role of students towards Smartness, Mr. Arvind Dhingra,Honorary Secretary,The Institute of Engineers, Ludhiana state centre called upon the students to involve more closely in experimentation. Ms. Mandeep Kaur Sidhu , Founder & CEO Simbacart ,Jalandhar-Amritsar delivered the Key note presentation on smart city. FET also organized an Engineering Exhibition, and the collage competition The theme of the competitions were “Technological development and environment”. A total of 42 projects were contributed, participated by about 150 student both. The star attraction was a scooter converted into a four wheeler, though other projects – electronic and computerized attracted large attractions. Guest Lecture on "INNOVATIVE MODEL MAKING"